Sales Presentation Training Materials are designed for trainers to teach an organization’s sales team how to create dynamite sales presentations! Train your employees how to write proposals, preparation tips, how to use persuasive language and much more! 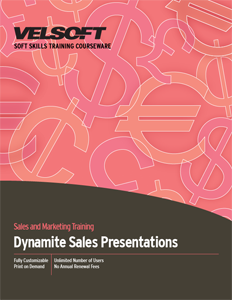 Seeing is Believing This sample manual to teach Dynamite Sales Presentations is in MS Word format. For trainers looking for an easy, customizable way to teach participants the components of an effective sales presentation, Sales Presentation training material provides the instruction neceessary to create dynamite sales presenations! This business sales presentation training courseware includes training sessions on how to write a stunning business proposal, whether it’s formal or informal; how to polish a first impression so the presentation is a success from start to finish; and how to draft, structure, and create an effective sales presentation for large or small audiences. Including tips on body language, style, and when to use persuasive language. Velsoft’s Sales presentation training material is easily customized to meet the trainer’s needs, and can be used with Velsoft’s eLearning website. Instructors can combine classroom-led content with interactive, web-based material as part of a blended learning solution students can use to learn independently.